Ever since I shared my first slow cooker recipe, Osso Bucco, back in May 2013 , I have been on a mission to adapt more classic slow cooker recipes to healthier versions, to cater for a wider range of eating plans and styles. 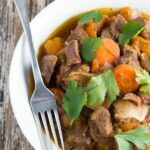 My latest recipe, Slow Cooker Moroccan Lamb Stew, does not disappoint. This meal is rich in flavour and so so tender, and very easy to make, meaning it’s the perfect set-and-forget slow cooker meal. In fact, it is probably in contention for a top three spot, right up there with my Cashew Chicken, Butter Chicken and Osso Bucco. You can also make your Moroccan spice for this meal. I hope you enjoy my latest slow cooker recipe. 1 cup chicken stock, preferably home made or organic. Add the lamb pieces to the slow cooker. Add the Moroccan spice and mix well to combine. Add garlic, onions, carrots, sweet potato, crushed tomato, chicken stock. Season with salt and pepper. Cook on high heat for 4-5 hours or on low heat for 8-10 hours. Remove from the slow cooker and serve with your favourite side.